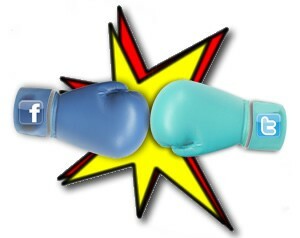 Facebook vs. Twitter – Which is Better for Companies? Facebook and Twitter are a great way to engage and inform your customers in social. So can Pinterest, Instagram and a hand full of others, but the two big handles each have soemthing the other, and others do not. Facebook has a targeted reach unmatched by other platforms, reaching 71% of the adult population. Granted at this point the reach is totally paid in nature, but it arguably works well. It’s almost a waste of money to post on Facebook as a company if you do not have media dollars to support your efforts. You have the ability to target specific fans and still keep your timeline pure to your broader audience, although you’ll notice few will actually visit your page. Twitter reaches only 23% of the adult population but has the unique nature of carrying your message far, wide and quickly. The problem with Twitter is still that 23%. Unless your message reaches newsworthy proportions and gets picked up by more mainstream media, (think Mashable, The Verge, ABC News) then you’re really not reaching most of the population. Of course you could be newsworthy for the wrong reason, which can happen even with the best of intents. So which platform is better for companies? It depends. Each platform has its uses and strong points but I’d have to give the edge to Facebook in this particular head-to-head. If you got lucky enough to create a very good but not quite viral piece of content, the ability to have it shared to a larger, more targeted audience is greater with Facebook. Of course there are more factors than simply reach, depending on the desired audience, and you should always plan your campaign with that in mind. Next story What do You Want from Your Social Channels? Previous story Can a 1.5 Star Review Sink Your Product or Service?